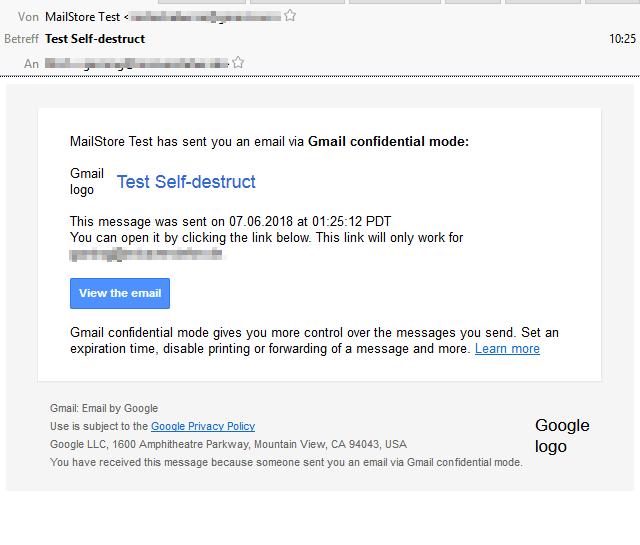 Can self-destructive/confidential emails be archived by MailStore Software? Recipient of this email: The actually received email cannot be archived, but the notification about this email will be archived instead. “Confidential” emails are a Google specific feature. These emails are not actually sent, the recipient receives a notification email instead. In this notification email, an external link to the email content is provided. The linked page can only be viewed after successful authentication and will show the email in a Gmail-style web interface. When the recipient uses the new Gmail web interface, the confidential email will be shown directly, as the authentication and retrieval of external content is obviously being resolved internally.